Reservations are strongly recommended and must be made through Island Spa Catalina. Click here for more information and to reserve your space or call 310-510-7300. De-stress at the Catalina Island Museum! 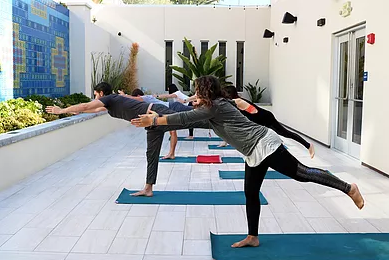 In partnership with Island Spa Catalina, you are invited to a yoga class in our beautiful Hinchliffe Family Atrium. Afterwards attendees will have access to the museum and exhibitions. This is a great opportunity to view the new Wrigley's Catalina: A Centennial Celebration exhibition. Following the guests will have access to the spa facilities for the day to lounge by the pool and take in the view on our relaxation deck. All while enjoying all we have to offer at Island Spa Catalina.